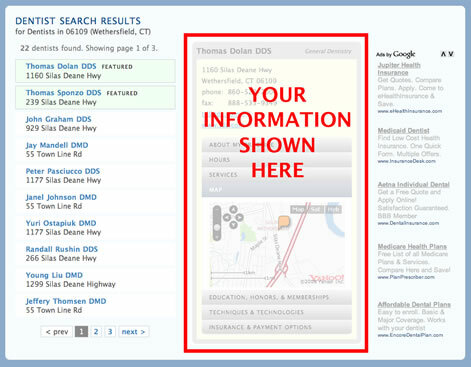 When visitors are looking for a dentist in your area, your information can be displayed front and center to them! You sign up to be a featured dentist in a given city and when pages for that city are shown, your featured information is shown. If there are multiple featured dentists for a city, the featured area will rotate between them. This is a quick, affordable way to increase your visibility to prospective new patients. A featured listing costs $285/year - that's only $23.75 per month. To sign up, just call us at 801-533-4199. Our hours are 8am - 4pm, Mountain Time, Monday - Friday. Copyright © 2019 National Directory of Dentists LLC. All rights reserved.